I have had so many family members moving in the last two months! Plus, we moved into our 38-foot motor home! Can we be done moving for a while??? Um…as I ask that question, I have to laugh, since I have just moved into a home on wheels! …but just moving locations isn’t the same, right, since it all comes with us…? 1. Going with us in the Hope Mobile? 2. Being packed away in storage to still have, once we are done with this season of traveling (having no idea when that will be)? 3. Being given to one of the kids or grandkids? 4. Getting rid of it, either in our rummage sale or just trash it? At the same time, Dave and I had to go through every item in his parent’s apartment, making the same kind of decisions. Does it go with her to her new place? Do we ask family members if they want it? Do we toss it? Do we hang on to it for her? Do we put it in our rummage sale? Simple lives… that’s what most of us want, isn’t it? But it seems to rarely happen, no matter how hard we try. 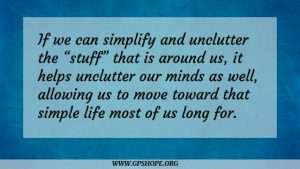 One powerful thing I have learned is that if we can simplify and unclutter the “stuff” that is around us, it helps unclutter our minds as well, allowing us to move toward that simple life most of us long for. In all of this moving, I received some insights, and had some “I wish I would have…” moments that I thought I would share with you, in hopes that it will help you simplify some things in life now, instead of when it is somewhat forced on you (or someone else for you) because of unforeseen circumstances. 1. DON’T PUT IT OFF. Is there an area you have been putting off for months (or even years) because it just seems too much to tackle? Maybe it’s your attic or a storage area in the basement. Maybe it is all the piles on your kitchen counters and table, or your bedroom closet that is stuffed so full that you don’t even know what is in there, or so many things piled in a dining room that is no longer usable. 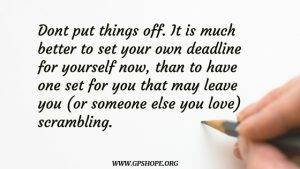 It is much better to set your own deadline for yourself now, than to have one set for you that may leave you (or someone else you love) scrambling. 2. DON’T DO IT BY YOURSELF. Exchange the favor with a friend. Offer to help her tackle a big project if she comes and helps you with yours. Put a date on the calendar and stick to it. Make it fun with some rewards (like maybe bake something yummy you can sit down and snack on when you get to the half-way point, or take a break and get a pedicure) then go back and finish. Having someone help not only makes it easier to whip through your project, but it gives a needed unbiased opinion on what needs to go out the door. 3. TAKE EVERYTHING OUT OF ITS PLACE (AND I MEAN EVERYTHING) AND PUT IT IN A PILE SOMEWHERE. This is one of the most helpful things I discovered. If absolutely everything was pulled out of kitchen cupboards and drawers and piled on the kitchen table, chairs and floor, (or everything taken out of the bedroom closet and dresser drawers and piled on the bed, or literally everything removed from the dining room that has become a storage room, etc.) I was forced to make a decision on whether or not each item would be kept and put back away or sent out the door to someone else who was looking for that item I never use. Added bonus: You will also probably keep at that project until it is done, because you can’t function (cook, get dressed, etc.) until it is complete. 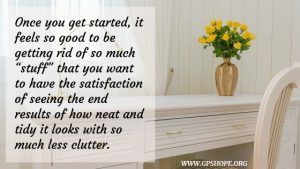 Plus, once you get started, it feels so good to be getting rid of so much “stuff” that you want to have the satisfaction of seeing the end results of how neat and tidy it looks with so much less clutter. 4. ASK YOURSELF IF THAT ITEM IS STILL BEING USED BECAUSE IT STILL GIVES YOU JOY. I discovered how many things I was hanging on to that had a memory attached to it, or “what if I still need it or want it later?” If it hasn’t been used (or worn) in over a year, chances are pretty high it will continue to sit there for another year, and another, and another… you get the point. The more years something has sat without serving its purpose, the more reason that is to part with it. If getting rid of items no longer used is a struggle for you, let me share something that may sound strange, but really seems to help. Tell that item thank you for serving its purpose in your life, and that you no longer need it. Yes, out loud. And yes, like I said, it sounds weird, but there is something that seems to break our attachment to an item if we release it from having a hold on us for whatever that reason is. Doing that simple thing gives us permission and freedom to send those things that are taking up mental and physical space in our lives out the door with no hesitations or regrets. And once you have an area tackled and under control, make sure you don’t allow things to pile up again! Instead of tossing something somewhere (thinking you will take care of it later) make the decision while that item is still in your hands whether to toss it, put it away, or place it in a box, knowing that box will be given away as soon as it gets filled. Simplifying what is around us in our homes transfers into other areas in our lives. 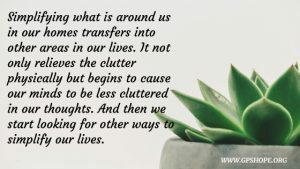 It not only relieves the clutter physically but begins to cause our minds to be less cluttered in our thoughts. And then we start looking for other ways to simplify our lives. Doing these four things is not a guarantee to a simplified life. But they are a great way to start, to help you move in that direction. And speaking of moving in a direction, by the time you read this, we will have done our final loading and pulled out to be on the road full-time in our house on wheels. I don’t know if the outward circumstances of my life will become simpler, traveling in and living from a motor coach for our full-time ministry to grieving parents. We all know there are things in life that are out of our control. But I do know that I plan on controlling what I can, by not allowing clutter to surround me in this new season of my life. Have you experienced a deep loss? 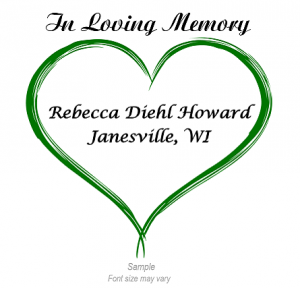 We would be honored to have a heart placed in loving memory on the GPS Hope motor home with his or her name on it, to travel with us. Find out more by clicking here. GPS Hope exists to walk with grieving parents through the suffocating darkness of child-loss to a place of hope, light and purpose. We also support families, friends and coworkers who want to know how to support these parents both short and long-term. If you are not a bereaved parent but want to support those who are, or want to follow us as we give hope to these precious parents, please connect with us at Friends of GPS Hope on Facebook. If you are a bereaved parent, we encourage you to connect with us on Facebook. Subscribe to Laura’s YouTube channel for grieving parents.